Following an accidental fire at the IOCL Jaipur Terminal, an extensive review of safety measures recommended by the MB Lal Committee has resulted in the introduction of failsafe actuators for critical tank farm applications. These valves, known as ROSOV (Remote Operated Shut-off Valves), now provide tank overfill protection at the majority of storage facilities owned by the Indian oil industry. The application required the valves to be electrically operated, spring-return failsafe with SIL2 functional safety certification for use in hazardous areas. 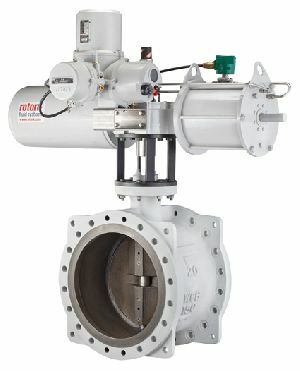 During the two-year specification writing period, Rotork worked closely with the three main oil companies in India, providing live product presentations, technical advice and performance reports, leading to the selection of Rotork Skilmatic SI/EH electro-hydraulic actuators operating triple-offset butterfly valves as the standard for the critical ROSOV application. The Rotork Skilmatic self-contained electro-hydraulic valve actuator combines all-electric simplicity with the precision of hydraulic actuation and the reliability of spring-return failsafe operation. Standard Skilmatic features include non-intrusive setting, performance monitoring and configurable data logging of valve and process data for analysis, preventative maintenance and asset management. To-date, over 1600 Skilmatic actuators have been supplied through Indian valvemakers. All actuators are certified explosionproof to Exd llB T4 with CCoE (Chief Controller of Explosives) approval and SIL2 functional safety system certification. For this application actuators are supplied with dual Modbus fieldbus communications and separate local controls mounted outside the tank bung with a local ESD (Emergency Shut Down) pushbutton. Along with the above, Rotork was also selected to supply 4000 CP/GP spring return pneumatic actuators to various valvemakers for tank farm applications. Rotork therefore took the lead as the single vendor for failsafe actuators on triple-offset butterfly valves on all tank farm applications. Find out more about Skilmatic Electro-hydraulic acuators, CP and GP range Pneumatic actuators and Modbus Control Networks.